Beautiful hop fields near Watou, Belgium. The Middle Ages were a difficult time for brewers. Grains had to be dried over open fires and were often burned and girdled with smoke. Brewing water was dirty and contaminated with bacteria. Yeast had not been discovered, and beer fermentation was often accomplished by the wild yeasts and bacteria in the air or on the brewery’s old wooden stirring paddle. Worst of all, to balance the sweet (or oftentimes sour) nature of beer, brewers would add a staggering array of peculiar vegetables, spices, herbs and even hay. Beer drinkers of the time never knew what they were going to get. About 400 years ago a huge leap in beer brewing occurred – some lucky, desperate brewer decided to add hops to his boiling kettle. Hops (scientifically known as Humulus lupulus) are vines that grow wild all across Europe and produce fragrant flower cones full of spicy, bitter, sticky resins. When the cones are boiled in wort (unfermented beer) for an hour or more, the resins produce a delightful bitterness that is a perfect counterpoint to barley malt sweetness. If the brewer tossed in hops a few minutes before the end of the boil, then an agreeable, floral flavor and aroma emerged in the beer. Dried hops added directly to the beer’s serving barrel (in a process known as dry-hopping) adds an even greater depth of floral aromatics. The blessed brewers then quickly noticed that hopped beers resisted souring and stayed fresh for a much longer time. This is due to the antibacterial and antioxidant qualities of the miraculous hop resins. Despite all this, some old-school brewers of the time denounced the hop as an invasive weed filled with vile toxins that should never be added to the brew. But the multitudinous merits of hops in beer soon won over the non-believers, and a new brewing tradition was born. In 1516 Germany went so far as to enact Europe’s first written law protecting consumers – the famous Reinheitsgebot dictated that German beer should contain only three ingredients – water, malt and hops (again, brewers were still in the dark about yeast). Hops grace almost every beer made today, and 98% of all hops are grown in five countries – England, Belgium, Germany, Czech Republic and the United States. 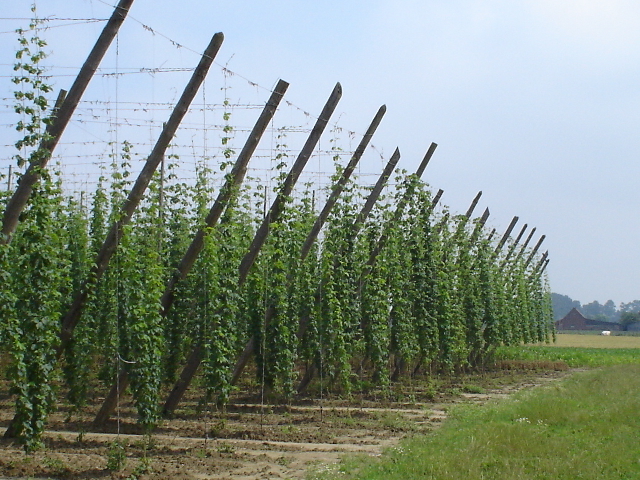 These nations produce hops with characteristic sets of notable flavors and aromas. Hops from the U.K. impart a woody, tea-like note to English ales. Belgian, German and Czech varieties bless their brews with delicate flavors and aromas of flowers. Most American hops are raised in the states of Oregon and Washington and confer distinctive overtones of pine and citrus to American ales. Pilsner Urquell is the original Bohemian Pilsner from the Czech town of Pilsen. Unlike American lagers that impersonate true “pilsners,” Urquell explodes with elegant and flowery hop aroma, flavor and bitterness to balance the golden malt. Unfortunately, this beer is sold in green bottles that do a pitiful job of protecting it from light, and light exposure can turn hop aroma into something very reminiscent of a skunk. All beer in green and clear bottles is sensitive to the light of day. Most English ales are balanced more toward malt than hops, but American Pale Ales like Sierra Nevada are just the opposite. Sierra Nevada invented the American Pale Ale back in the 1980s and was the first brewery to use the now popular Cascade hop that has a decidedly grapefruit-like note. Rogue Shakespeare Stout hails from Oregon and offers a mouthful of dark, roasted malts (that are very espresso-like) backed up by a powerful, citrusy hop bitterness. This is one of the world’s richest and most flavorful stouts. India Pale Ales started in the 1800s as versions of English Ales that were heavily hopped in order to stay fresh along the journey to the British military in India. American craft brewers have perfected the hop explosiveness of a stalwart IPA with intense examples like Sweetwater IPA and Anchor Liberty Ale. For the brave of heart there are far-out ales with high percentages of alcohol to go along with their lavish use of hops. Imperial IPAs have almost double the amount of malt, hops and alcohol as standard examples, and Terrapin Rye Squared and Great Divide Hercules IPA are two outstanding examples that will astound the taste buds.